So today I was thinking in green. 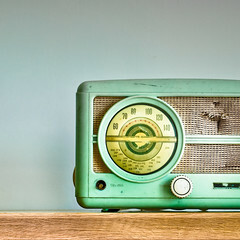 Specifically the green of this radio. I have a small tin first aid kit box in my studio that still has the instructions in it, and it's this green too. It's a nice green. I can imagine some vintage metal lawn chairs in this green keeping my back deck company.